(Nanowerk News) PI (Physik Instrumente), a leader in precision motion control solutions, will show its latest rotary air bearing stage series at this year’s LAM/LME (Laser Additive Manufacturing / Laser’s for Manufacturing Event) show on March 27/8 in the Schaumburg Convention Center. PI’s new A-635/A-637 PIglide low-profile stages have no rolling or sliding elements and deliver frictionless, non-contact motion, resulting in negligible reversal error, better wobble, eccentricity and velocity stability – ideal prerequisites for high-end industrial applications such as inspection, metrology, calibration, and scanning, including cleanroom environments. The PIglide RL rotary stages offer superior accuracy, flatness, and wobble performance. Featuring 3-phase, low-cogging slotless torque motors with velocity to 500rpm and optical encoders, these stages provide outstanding performance such as 0.0015µrad resolution ±2µrad bidirectional repeatability and absolute accuracy of ±6µrad (with error compensation and ACS motion controller). Geometric performance is also excellent with 50nm flatness, ±50nm radial runout and 1µrad wobble. 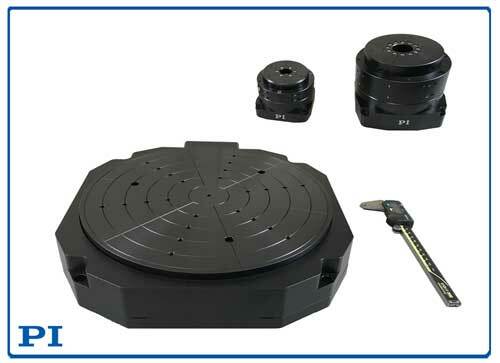 Available in 2 motion platform diameter sizes of 200 or 300mm, various options can be combined to create a solution ideal for point-to-point indexing or constant velocity scanning. These rotary positioners have a virtually unlimited life, there are no parts that wear or require maintenance. PI designs and manufactures all air bearing products in the USA. PI’s engineering team has more than 200 man years of air bearing design experience. In addition to customized systems for OEMs, PI offers a substantial standard product line of air bearing stages that includes motorized and non-motorized, linear, rotary, spherical, X/XY, voice coil, compact, and large scale systems, as a complement to the existing comprehensive range of piezo nano positioning stages, traditional motorized positioners and hexapod 6-axis parallel positioning systems. The addition of air bearing technology puts PI in the unique position to cover the whole motion range from finger-tip sized nano-positioners to large scale stages with long travel ranges, through a plethora of different drives and guiding systems that can be tailored to meet the needs of an OEM or customer.